Sunday, 2 September 2018, 8:51a.m. A century after the "Great Flu" killed nearly 9000 New Zealanders in just a few months, the creation of a national memorial to them is being planned. The influenza pandemic swept around the world in 1918 and 1919. In New Zealand, the death rate from the pandemic peaked in mid-November 1918. It remains the worst natural disaster in the country's recorded history. The Ministry for Culture and Heritage will install a memorial plaque at the Pukeahu National War Memorial Park in Wellington, although a spokeswoman indicated few details, the wording and the date of unveiling have not yet been decided. Public health researchers who have expressed their concern at the small number of plaques commemorating the pandemic are glad of the ministry's decision to create a national memorial. "Such a memorial is particularly important since there are typically several pandemics a century, so society needs to be reminded to prepare for them," said Professor Nick Wilson of Otago University at Wellington. He and colleagues found just seven publicly accessible memorials to the victims of the pandemic, and nine others that either were in private settings —​ mainly marae and urupā —​ or did not refer specifically to the pandemic. Wilson urged that the new memorial mention the thousands of health and community workers who helped in the pandemic. Among these were Dr Margaret Cruickshank, the first New Zealand-born woman to register as a doctor. One of 14 doctors to die in New Zealand during the pandemic, she had worked tirelessly caring for her patients and even helped out with feeding babies and milking cows. Wilson said the volunteers who helped during the pandemic included boy scouts, who delivered food to homes where everyone was sick. He noted these health workers and volunteers were mentioned on the memorial at Waikumete Cemetery in Auckland. "This is one of the few publicly accessible memorials to this pandemic." • Waikumete Cemetery, Auckland, where many of the 1128 Aucklanders killed by influenza in the pandemic were buried. • Headstone on the grave of nurse Jessie Linton at the Shortland Historic Cemetery in Thames. • Featherston Military Camp memorial obelisk. 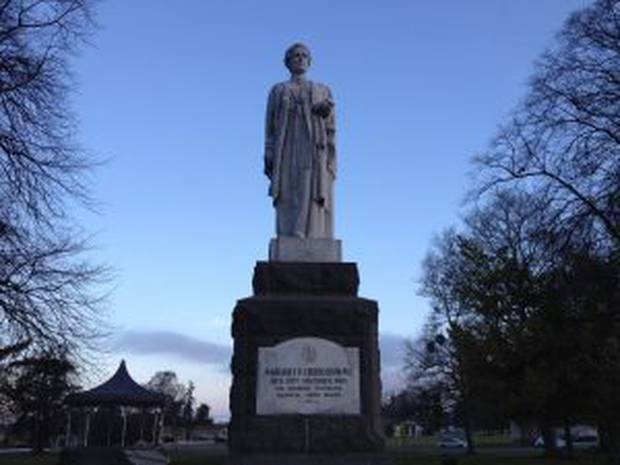 • Statue in Seddon Square, Waimate, of Dr Margaret Cruickshank, who was killed by the influenza pandemic. • Dr Margaret Cruickshank's grave and an associated information board at the Waimate Old Cemetery. • Memorial Chapel at Christchurch Hospital site, which commemorates two nurses who died in the pandemic and women who died in any war. • Chapel plaque at Dunedin Hospital dedicated to nurses and volunteers who died in war service or from the pandemic.